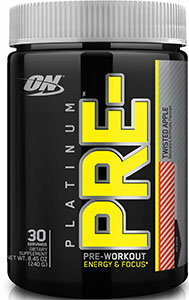 Platinum PRE- By Optimum Nutrition at SameDaySupplements.com® for lowest price. - 4 Grams of Micronized Citrulline & PepForm Citrulline Peptides: L-citrulline is a precursor to Nitric Oxide (N.O.) synthesis and may support performance during high-intensity exercise. Each 4-gram dose in PLATINUM PRE- combines micronized L-citrulline with an exclusive patent-pending peptide delivery system. - 3.2 Grams of CarnoSyn Beta-Alanine: Beta-alanine is a key building block for carnosine – a compound that helps neutralize acidic byproducts generated during high-intensity training. Research shows that daily supplementation increases muscle carnosine levels, supporting harder and longer training sessions. - 400 mg Caffeine: As the subject of numerous studies, caffeine is one of the most well-researched performance enhancing compounds. Along with increased energy and alertness, caffeine has been shown to help sharpen mental focus and reduce the perception of physical effort during exercise. - 250 mg Capsicum Fruit Extract: Capsicum from chili peppers provides metabolic support. The capsicum dose in PLATINUM PRE- has been encapsulated so it doesn't interfere with the refreshing fruit flavor. - 500 mg PhytoBlend + 200 mg Vitamin C: A blend of Beet Juice Powder, Grape Seed Extract, Red Wine Grape Extract and Citrus Bioflavonoids with a potent dose of vitamin C provide antioxidant support to round out this comprehensive pre-workout formula. Of course, you also expect ON to provide more, and this Platinum-level pre-workout powder is no exception. In addition to intense energy and focus, the formula supports training performance with beta-alanine and citrulline. A novel fruit extract supports metabolism and a unique PhytoBlend completes the package. Those who demand more depend on Optimum Nutrition Platinum PRE. 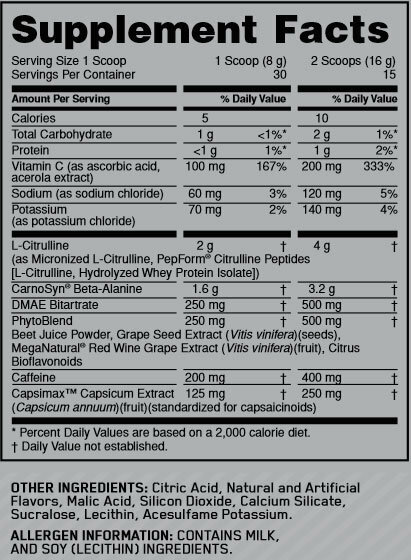 What's In Optimum Nutrition Platinum PRE-? Take 1-2 scoops of Platinum PRE 20-40 minutes before training, or anytime you want a boost of energy and alertness. Mix each scoop of Platinum PRE with 6-10 oz (177-295mL) of cold water (to desired sweetness) and consume immediately. Start with 1 scoop of Platinum PRE or less to assess your tolerance. DO NOT EXCEED MORE THAN 2 SERVINGS PER DAY. Pré Treino òtimo, dá um PUMP bacana, treino mais intenso, TOP. No Brasil não se encontra esse Pré Treino. Ive tried all the flavors on Optimum's PRE but this one is by far the best. With this supplement you get an intense amount energy and focus whether it be at the gym or work or whatever you may need it for. The only downside are the clumps at the bottom when its mixed. I'm not sure if its the chunks of beta alanine or what that haven't been completely dissolved but if you don't swallow the clumps completely they have the tendency to burn the inside of you mouth! We have a large selection of in-stock OPTIMUM NUTRITION products including Pre Workout items and others for the lowest prices at SameDaySupplements.com® It's always easy to shop for Platinum PRE- By Optimum Nutrition at SameDaySupplements.com® because you can browse by reviews, brand, prices or search for specific ingredients using our search tool. In-stock orders placed before 3pm EST ship out the same day to USA, Brazil, United Kingdom, Canada, Germany, Australia, Japan, India, France and worldwide at the cheapest prices online.